From Square Enix. New Play Arts -Kai- versions of the reimagined charcters from J.J. Abrams' films! Captain Kirk is the fearless young man who leads the U.S.S. Enterprise and will not bow to any threats. Accessories include the communicator, to pose him as if he is contacting the Enterprise, his phaser and utility belt, to enjoy a style unique to the captain of the U.S.S. Enterprise. Spock's impassive personality and unique look can easily be identified as an icon of the STAR TREK series. With this PLAY ARTS KAI iteration, we have incorporated various pieces and parts to recreate his style to the utmost. 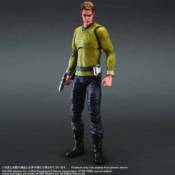 Accessories include a communicator, phaser, utility belt, and an alternate hand that replicates a Vulcan salute. Both figures come with a display stand.